Losing a loved one is a time of grief and sorrow; nothing can change that. However, when you send flowers to the family of the deceased, you show that you care and that is a source of comfort. 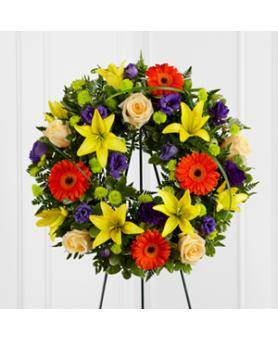 Sending flowers is an excellent way to pay your respects to the family of the deceased. Funeral flower etiquette has relaxed over the years and is really quite simple. Even today, at most visitations, you will see funeral flowers. Etiquette for funerals has called for flowers for quite some time. Flowers have always been a symbol of new life and resurrection, which is why they are popular in the funerals of many religions. Flowers die in the fall only to return in the spring. If chosen carefully, they can reflect the deceased’s life; for instance, the person’s favorite color or flower. Of course, they are a source of comfort to the family of the deceased. Funeral directors have told me that flowers are always noticed and commented on at visitations and funerals. I know that when I attend a visitation, the floral arrangements provide a pleasant diversion and a bit of cheer and comfort in a time of sorrow. I have also noticed that they aid conversation as they are a light hearted subject to talk about when it is hard to know what to say. I get a lot of questions about funeral flower etiquette.Today in most cultures of the United States, all flowers are appropriate flowers for funeral services. 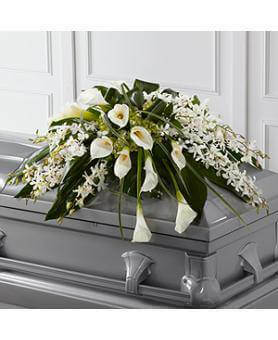 I commonly get requests for and recommend arrangements that contain the deceased’s favorite color or favorite flower. Brightly colored flower arrangements are perfectly acceptable these days. Most florists are familiar with proper etiquette for specific cultures and will guide you in sending something appropriate. If the arrangement is large, it should be sent to the funeral home. Smaller arrangements can be sent to either the funeral home or the homes of family members. Usually the smaller arrangements will be taken home by family after the funeral if they are sent to the funeral home. If you hear about a death late, it is still appropriate to send flowers to the home of the family even weeks after the funeral. Although anything goes today as far as flowers and funeral etiquette, flowers with special meanings are traditionally used in funerals. Chrysanthemums are commonly seen at funerals; they represent everlasting life and they are available in many colors. Gladioli are another popular flower for funerals as their tall size fills out larger arrangements well and they represent strength. White flowers symbolize honor and reverence, especially white roses. Forget-me-nots of course represent remembrance and hope, lilies peace, and ferns sincerity. You will often see carnations, daisies, and tulips as well. Traditionally, white and pale colored flowers were common at funerals. All of these flowers are still appropriate flowers for funeral services. There are several types of flower arrangements for funerals. The casket spray lies on top of the casket and is most always bought by the family; do not buy one of these unless you have consulted the family. 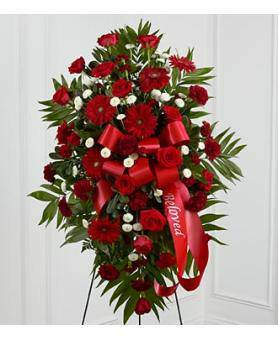 Large standing sprays, wreaths, hearts, and crosses made of flowers are appropriate to send to the funeral home. They are generally displayed on an easel type of holder and they can be taken to the grave site. Smaller vases of flowers, baskets of flowers, and living plant baskets can be sent to the funeral home or directly to the houses of family members. Small bouquets or pillows of flowers to include in the casket with the deceased are some additional funeral flowers. Etiquette is further followed when you also send a sympathy card with your arrangement. Funerals are a time of sorrow, but by sending flowers you can provide comfort and beauty to the family of the deceased. It will mean a lot to them to know that you are thinking of them. Sending flowers is a time honored way to show your respect for the deceased.